Suggestion - Minr Map Dating | Minr.org - Minecraft's oldest and best parkour, maze and adventure server. Discussion in 'The Helpdesk' started by The_Fire_Ghoul, Jan 8, 2019. I really like the idea of having challenges consisting of all the maps published within a certain year in chronological order. Currently we only have a 2017 challenge and a soon-to-be-added 2018 challenge that I laid out elsewhere. So I want to try and list out every year of the server’s lifespan as far back as I and others with good knowledge of pre-2015 Minr can go. As for maps that were pulled then resubmitted, I’m going to list them when they were originally published if all they received were a few updates and changes (like Kraze Vil and Eternity), and list them when they were republished if the map received a complete overhaul (like ANHUR and Pandemonium). Please correct me you notice anything wrong or disagree with my placement on a republished map. I’ll list out every map in “Map Submissions” as best as I can. I know nothing past the last page of threads, so I’m reaching out to long-time veteran players with this thread for help with this. - Dates before late-2016 that include the day of the month are probably not exact. - Another note: Because color changes use so many characters in BB text formatting, unfortunately I had to remove the coloration from every single listed map to save characters so this thread fits the 10,000 character limit. 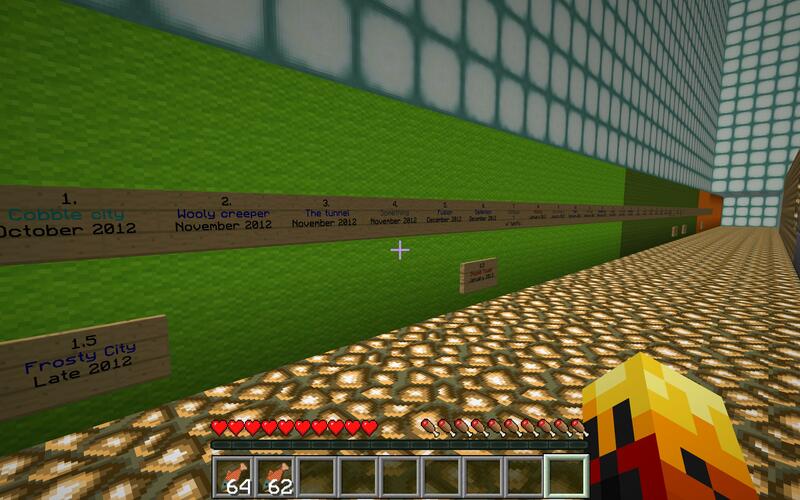 I instead plan to color-code the maps by Minecraft update after the list is done. Wool Town: Retro — ?? My 1st Survival — ?? If any of you know the date or even just the approximate month or year any of these maps were published, let me know. Thanks so much! I needed to make this list for a future idea, but I guess you already did the work for me! Probably best to keep this up-to-date, it's quite handy. Will see if I can find any dates later when I get on. hoh this is difficult, I'll try to recall some map, though I'm not 100% certain. 4 Corners Dojo - May 2013 - The month I was opped. My first action as an OP was figuring out how to publish my newly minted map. Big Egyptian - must be at LEAST 2013 (Guessing 2014?) because it was after I was opped. Gideon's Place was pack's first map, so that places before The Face in 2011. 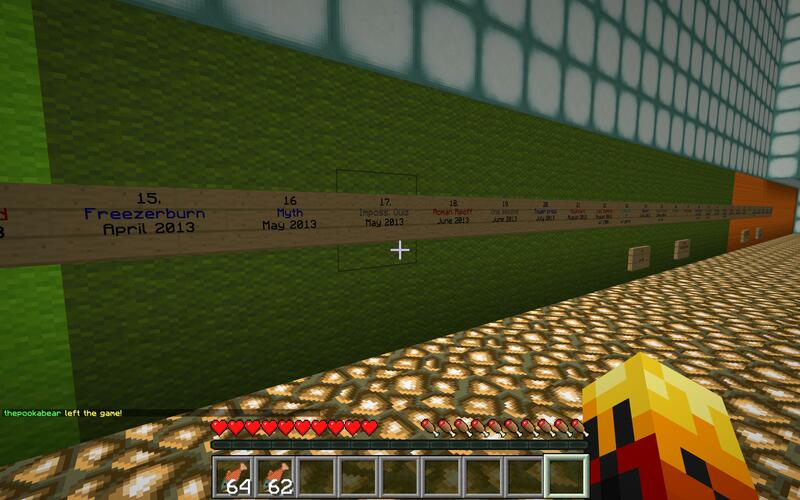 Mob Parkour, Lava parkour, Orig 1-2, Jiga's are all 2010 maps. Lava Maze is 2011. Zara's Dark Maze - 2011? Edit - Made the thread a sticky for now. I'd love to see most of the maps get dated. Mob parkour 2.0 - 2012-13? Xmas parkour - December 2013 or 2014? Old HC (The 5 level 1?) compiled in 2012 IIRC. If you want access to my form and /warp mapindex scripts let me know and send me your email and i'll give you access to the scripts. I've made a very large build showcasing when each and every mob and block in the game was added and in what update. You can view it at /warp mc_updates if you're curious, but I'm mainly using it to help me pinpoint which version the unlisted maps were made in based on the blocks they do and do not contain. Mob Parkour was after Lava Parkour and they were both in 2010. Scudz 3D maze was early 2011, as was Fire & Ice. "Zen made it through all 6 lvls. Becuz the portals aren't working, I tp'ed him to the start of Z's and Jiga's mazes, and he did them both too."